We want to celebrate all of the wonderful ways that our customers are using our themes. To do this, we are launching a contest to award the coolest and most creative uses of our products. All you need to do to enter the contest is submit your website (which must be using an Elegant Theme) using the form below. In 1 week we will be releasing the top 20 contestants (as curated by our team) to be chosen by community vote! The top 3 websites will be awarded some awesome prizes, and all of the best submissions will be added to our upcoming Customer Showcase page. There are no rules as to what might make your website special, but some things that we may be looking for include: creative customizations, interesting subject matter and unique implementation. All you need to do to enter to contest is fill out the form below. Next week we will be picking our 20 favorite websites and putting them up for a public vote! 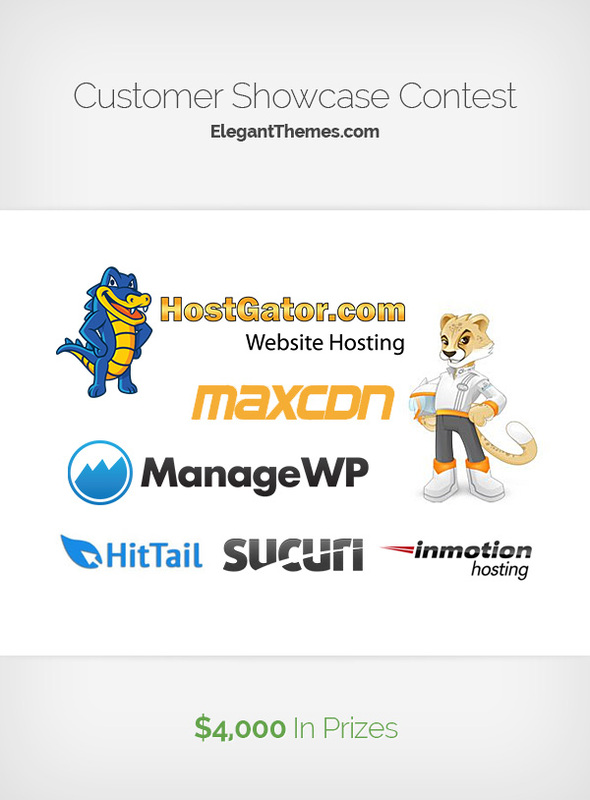 This is an awesome contest for Elegant Themes customers. Such a Great opportunity for developers to win this biggest price ever in Elegant Themes contest. Great contest and nice range of price as well. ManageWP is proud to be supporting the contest, and we’re looking forward to seeing some incredible and beautiful looking Elegant Themes! So be sure to submit your goods and win some cool prizes! Thanks for sponsoring the contest James! I know our users appreciate it. Feel free to enter as many as you like! When is the last date for entry please? The last day will be next Tuesday. There’s no rule on how many sites you can enter right? Nope, there is no limit as to how many websites you can enter, as long as they are all running an ET theme. Great, Waiting for the results! Can I enter more than 1 that I created? How do I enter more than one? I entered one and now I can’t get back to the form. Though, for now I tried different browser ! Me too, diff browser and used commas. Sorry about that. You can simply list multiple websites in your single submission. It looks like survey monkey does not allow multiple submissions per person. But this was not unknown before, so have already made multiples entries. I hope the entries won’t be disqualified ? When we will see first results ? Just waiting (I am in)! Excellent contest. I can’t wait to see who wins. Designing WordPress websites from Elegant Themes templates is a real “treat”… very clever designs and a dedicated support team makes life so much “sweeter” for graphic designers like me breaking into web design. Cool! I’m actually looking forward to seeing how others might be using/customizing the same themes. Great idea Nick, I sure do use these themes. I think every site I design I use ET. Now that is a lot of sites! Great contest ! I will submit my website and we will see ! Will a SE friendly link be given to the 20 websites you select? What an amazing contest and a great way to see what other’s have done with elegant themes… excited to see the level of awesomeness and talent plus creativity. Most of our modifications are typographic. Remember, you chose a well-designed template in the first place. Great idea for a competition. Looking forward to seeing the entries and results. I am sure there will be some outstanding entries! Great contest and nice range of price as well. Thanks for the contest and We are waiting for winners. Ah I love contests aaaand I love love love Elegant Themes! I’m in!!! I have been using the themes for a while now and very happy with the themes! They are amazing and easy to use and configure! Great contest!! Have submitted several sites (I use ET for 99% of the sites I do) .. just a shame that the ones I’ve got in development won’t be finished in time! Really looking forward to seeing how others customise their sites 🙂 Thanks, Ellen. I would love my website to be included but I am still struggling to build it. Your themes are fabulous but your website and support process needs to be better. I actually found a more helpful tutorial on nimble theme made by someone else. You should include links to things like this. It also helps you to see whether you product is really as easy to use and intuitive as you think. Sample data exactly like the demos would be a real help – the demos are what sell. People can use that as the basis and go from there. Also, your website doesn’t have a general search button. I now know that sample data is available (although I know that it is not brilliant ) but cannot find out how to get it. Los temas de Eleghant Themes son fabulosos! … Este concurso es una gran oportunidad para todos. Agradezco a Nick y a todo su equipo por su profesionalidad. Folks, those prizes are awesome!!! This is a great idea Nick. I’ll have to have a go…. We are in 🙂 Woow what a nice prizes! Cool contest. I was just thinking today how great Elegant Themes really is. I used Thesis for my first blog but after their 2.0 came out I decided to use Elegant Themes for my next site. So glad I made the switch! Things like this contest are useful to build solid relationship with the customers, fidelity and brand loyalty.